The G.A.S.T heat allocation meter is the standard G.A.S. meter designed for use in the timing of heating or domestic hot water systems. This meter has multiple applications including FHA, central or individual domestic hot water heater, fan coil or fireplace. The G.A.S.T meter uses the proven G.A.S. hardware design to provide more accurate timing measurements in 36 second increments using standard non-proprietary equipment. Forced Hot Air Furnace installation of the G.A.S.T requires a connection to the 24vac or millivolt gas valve to measure runtime. In Domestic Hot Water Heater installations the G.A.S.T requires a 24vac gas valve or flue thermistor connection to measure gas flow “on time”. In fireplace installations the meter will be connected to the on/off switch and can be used on either 24vac or millivolt version of fireplaces. 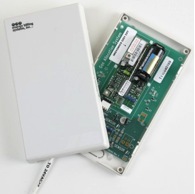 Fireplace G.A.S.T meters are available in surface mount or recessed versions. Fan coil installation of the G.A.S.T requires a connection to the 24vac or 120vac zone valve (with step down transformer) to measure runtime. Model Number: *Note: Most models available with Hexagram output. Please call for details.